Copyright © 2013 Ian James Martins et al. This is an open access article distributed under the Creative Commons Attribution License, which permits unrestricted use, distribution, and reproduction in any medium, provided the original work is properly cited. Age-related diseases are becoming a major concern as the world’s population grows older due to advances in medical technology, health and nutrition. Dementia accounts for a large proportion of age-related diseases and is characterised clinically by deterioration in cognitive processing, including memory. Alzheimer’s disease (AD) is the most common form of age-related dementia. The insulin-resistance syndrome has in many studies been associated with diabetes and AD. The social and economic consequences of this disease present a significant challenge to society, and it is imperative that strategies to prevent or delay the onset of diabetes are developed to prevent the proportion of the age related group with cardiovascular dysfunction progressing towards AD. AD is a neurodegenerative disease which presents clinically with key clinical symptoms including progressive decline in memory. Risk factors for AD include old age, family history of dementia, APOE e4 genotype, Down’s syndrome, obesity and type 2 diabetes. Epidemiological studies clearly suggest that human obesity is associated with the increased risk for atherosclerosis, contributing to the early onset of coronary artery disease and diabetes. The susceptibility of humans to obesity is far higher compared with other species . Amongst mammals, humans have been reported to have the highest level of fat than any other species as genes and environmental factors predispose humans to obesity . In an editorial by Testa and Ceriello published in 2007, the increased cell senescence associated with diabetes was associated with the limited ability of cells to divide with indication of cellular alteration in genes and genomic instability of the cells . Human obesity may complete the pathogenetic loop between cell senescence and diabetes through teleomere shortening and an association with an increased risk for atherosclerosis. This in turn contributes to the early onset of coronary artery disease and diabetes. Visceral obesity in particular increases the risk of atherosclerosis owing to both insulin resistance and dyslipoproteinemia and this global rise in obesity is possibly linked to telomere disease. Obesity has been closely linked to diabetes [4,5] and the association of obesity and telomere shortening has now been reported . In particular, telomere length, high density lipoprotein (HDL) cholesterol  and other risk factors for atherosclerosis that could be exacerbated by obesity-associated telomere dysfunction include hypertension and hyperlipidemia (particularly hypertriglyceridemia). These are also risk factors for AD. Circadian desynchrony and hyperphagia are also related to obesity and anti-aging, circadian proteins, such as sirtuins are known to regulate several cell functions by deacetylating both histone and nonhisotone targets. Sirtuins are NAD(+)dependent class III histone deacetylase (HDAC) proteins that target transcription factors to adapt gene expression to metabolic activity. Sirtuin 1 (Sirt1) is linked to life span, obesity and cardiovascular disease with effects on liver steatosis, inflammation, food intake, energy metabolism, cognition, mitochondrial biogenesis, neurogenesis, glucose/cholesterol metabolism and amyloidosis [8-22]. Regulation of Sirt1 by calorie restriction in extending life span has been recognized. Novel dietary acitvators of Sirt1 are required and designing compounds that have therapeutic potential for the control of telomere shortening, clock circuitry and generation of Aβ for the treatment of AD is the focus of several research groups [23-26]. Obesity in humans is seen to be associated with decreased life span in man and is an excellent model for the assessment of cell senescence, inflammation, diabetes and AD [27-31]. The understanding of alterations in genes/genomic stability and the environment in the aging brain has been the subject of various anti-aging programs as well as the mechanisms involved in anti-aging strategies related to low fat diets and reversing brain aging. The association between diabetes and neurodegenerative diseases (AD and Parkinson’s disease) have related the majority of the genes to cholesterol metabolism, cytokines and inflammation. Environmental factors such as diet and circadian desynchrony have become important in Western countries since interests in the global increase in obesity is possbily linked to diabetes, timing of food consumption, metabolic activity and alterations in adipose tissue leading to a release of adipokines (leptin and adiponectin). These adipokines increase with age and are associated with age related pathological alterations in cytokines associated with neuroinflammation [32,33]. The mechanism linking obesity with diabetes is unclear but the global epidemic indicates that most patients with type 2 diabetes are obese; over a third (34%) of US adults are obese and about 11% of these individuals have diabetes . The incidence of diabetes is predicated to increase to 21% by 2050 . The understanding of mechanisms which connects these two diseases has become important to diabetes research since therapeutics to control and stabilize the increase in the incidence of diabetes in Western communities is required. As lipids and proteins accumulate in cells, the cells become impaired and can no longer divide, decreasing the lifespan of the cell resulting in cell telomeres that have eroded or shortened with cell senescence. The telomere is a repeating sequence of DNA at the end of a chromosome (TTAGGG)n [34,35]. Aging results in a progressive loss of telomere repeats and with telomere shortening the cell ceases to replicate with alterations in lipid and protein metabolism with eventual cell death [34,35]. Obese individuals have shorter telomeres and an inverse relationship has been found with adiposity and telomere length [6,36,37]. The pathogenetic loop between obesity and diabetes has recently been related to Sirt1 which is involved in cellular senescence. The genomic instability and telomere dysfunction observed in obesity is now closely associated with the pathogenesis of diabetes, dyslipidemia and cardiovascular disease. 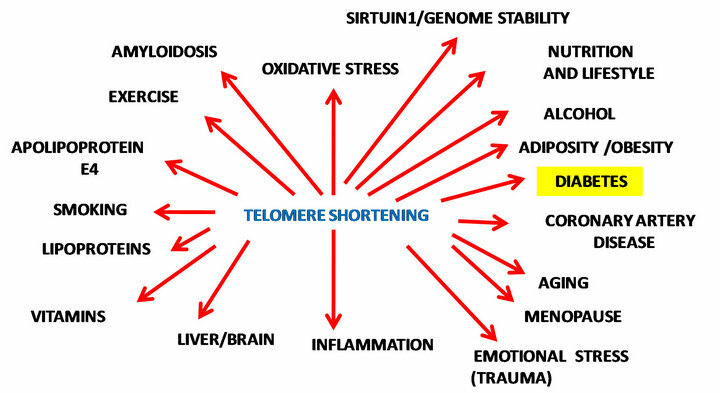 Diabetes, genetic and environmental factors have been reported to stress telomeres  through telomere shortening (Figure 1). Figure 1. Nutrition, lifestyle and aging determine telomerelength and genomic stability. for the elongation of telomeres to maintain genomic integrity. Telomerase is composed of the telomerase reverse transcriptase (TERT) and telomerase RNA components (TERC). These factors regulate the catalytic activity of telomerase . Telomerase protects cells from apoptosis via the maintenance of genomic integrity by stabilizing telomeres and adding DNA, in mediating cell survival and anti-apoptotic functions against various cytotoxic stresses [42,43]. Telomerase is closely connected to telomere length maintenance and control of genes involved in growth and cell proliferation . Anti-aging strategies that target telomere shortening in diabetes is of particular interest to biological aging since telomere shortening has been associated as an early risk for dementia [45,46]. Age-related changes in AD lead to neuronal apoptosis and therapy to delay the onset and even progression of Alzheimer’s disease are urgently required. Nutrition related to low fat diets and drugs that reduce intestinal absorption of fat with modulation of adipose tissue Sirt1 activity may improve the adipocyte brain crosstalk that may be assessed as a possible treatment of neuronal diseases that afflict diabetic and AD individuals. Sirt1 is essential for neurogenesis and calorie restriction activates Sirt1 with effects on longevity by modulation of phosphoinositide 3 kinase pathway that determines life span [47-49]. The role of Sirt1 in brain metabolic regulation and synaptic plasticity has been shown and maintenance of Sirt1 expression by calorie restriction regulates lipid metabolism and energy expenditure . Age associated cardiovascular changes have been strongly associated with alterations in Sirt1 [8-11] and genetic as well as experimental evidence of its control of lifespan is of interest to the areas of diabetes, neurodegeneration and AD. Telomere and telomerase activity has now taken an important place in AD therapeutics, using telomere length and telomerase activity in the determination of neuronal populations in these individuals [50,51]. Sirt1 and its role in AD is of interest with reviews that indicate that Sirt1 is closely connected to Abeta production, telomere maintenance and stem cell aging [39,40,52,53]. Interests in Sirt1 control of telomerase is of interest to diabetes and AD with recent publiccations suggesting telomerase inhibition is involved with abeta cell apoptosis. In AD, transgenic mice telomere length has also shown to be associated with amyloid pathology with indications that Sirt1 expression and activity is essential to neuronal population maintenance and prevention of AD. The estimate in global deaths due to diabetes was estimated to be 5.2% of all deaths in 2009 . In poorer countries, mortality related to diabetes was 2% - 3%, in countries such as the USA, Canada and the middle east the mortality was approx. 8% and for individuals between 35 - 64 years between 6% - 27% of the deaths were attributable to diabetes . In 2011, the largest number of people with diabetes were in India, China, United States of America and the Russian Federation and mortality in 2011 reached 8.2% of the global population  Nutrition and longevity are closely related and cellular senescence has been associated with telomere shortening as well as the life span of the organism [34,35]. Apart from nutrition, minor alcohol consumption has been shown in midlife to shorten telomeres and accelerate aging in older individuals [56,57]. Diet, cholesterol lowering drugs and exercise may improve telomere lengths. This may provide the classical evolutionary conserved environment to suit anti-inflammatory processes which control of food intake and circadian rhythm and promote normal liver and brain, lipid and protein homeostasis, ultimately preventing glucose intolerance and diabetes. Sirt1 (nutrient sensitive gene) is closely linked to food intake and the prevention of diabetes, which is linked to amyloidosis and may offer a potential therapy for AD treatment (Figure 2, [58,59]). Interests in high fat intake and the consumption of fat at specific times of the day requires further investigation as a mechanism for diabetes and AD induction. Drugs that reduce intestinal absorption of fat will modulate the tissue anti-aging protein Sirt1, improving the adipocyte brain crosstalk that should be assessed as a possible treatment of neuronal diseases such as AD. Figure 2. 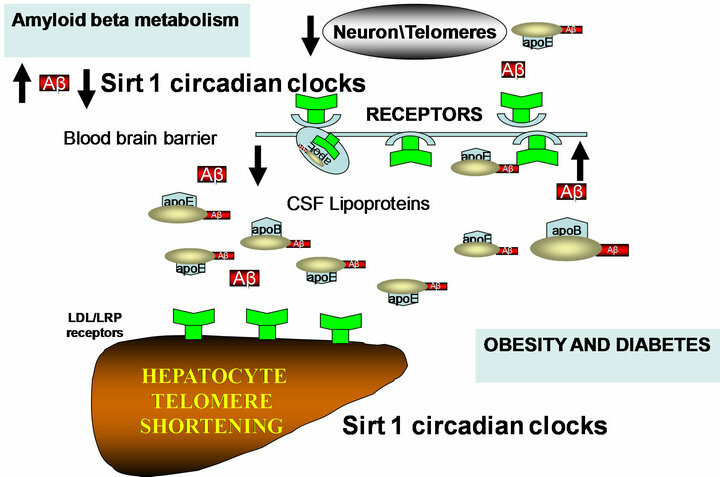 High fat and high cholesterol diets affect Sirt1 control of circadian rhythms with liver steatosis and effects on peripheral and brain amyloid beta metabolism. dividuals with longer lifespan have been shown to be diabetes free and increased mortality was attributed to increases in obesity . Age related pathologies, such as NAFLD, that have been linked to Type 2 diabetes and AD, indicate association between insulin resistance, oxidative stress and telomere shortening . Hepatocyte senescence, telomere shortening, nuclear size alterations and telomere foci have been closely associated to NAFLD and indicate mitochondrial dysfunction and lack of cell cycle progression beyond the cell cycle G1/S phase [64-68]. Interests in telomere shortening and insulin resistance indicate that the suprachiasmatic nucleus (SCN), which closely regulates peripheral clocks such as the liver (NAFLD) and adipose tissue (increased adiposity), is abnormal with relevance to the pathophysiology of disease  progression in obese, diabetic and AD individuals [69-72]. Drug therapies that target the brain have not been successful in preventing amyloid deposition but drugs that target the periphery may be promising by lengthening peripheral cell telomeres, lowering plasma fat and cholesterol and activating adipose tissue, liver and brain metabolic activity. Interest in Sirt1 modulation of various proteins that regulate cellular inflammation, glucose and cholesterol homeostasis are relevant to diabetes and neurodegeneration. Regulation of this calorie-restricted gene, Sirt1, as an important control that targets obesity, diabetes and brain aging by suppression of inflammation as well as maintenance of neuroprotective mechanisms that facilitate normal food intake and vitamin E transport to the central nervous system essential for growth of neurons has been the interest of anti-aging research studies. Designing compounds for the regulation of Sirt1 to extend life span has been recognized and activators of Sirt1 in order for telomere maintenance have been reported. The use of melatonin, which is involved in telomere maintenace and circadian clock control , is relevant for the treatment of diabetes and AD as compared with other circadian rhythm drugs such as the benzodiazepines or non-benzodiazepines. The relationship between telomere erosion and apoE4 is closely associated  with the role of apolipoprotein E and its connections with inflammation/cytokines [73, 74] as an important control of telomere attrition in the periphery and the brain. The connections between dyslipidemia and inflammation have been reported in diabetes, where inflammation in the blood plasma and altered cytokines have been associated with changes in lipid metabolism (increased triglyceride and low HDL) and in the brain, alterations in the light/dark cycle . Drugs involved with telomere lengthening are possibly involved in the adaptation of the organism to the environment and require regulation of liver glucose and cholesterol and are controlled by dietary fat and cholesterol intake (Figure 2, [76-78]). The mechanism by which the e4 allele promotes AD risk could be associated with diabetes and telomere shortening as well as with abnormal regulation of food intake, explaining the hyperphagia associated changes in diabetes and AD [79-81]. Figure 3. Potential anti-aging therapies (left) delay the aging process by telomere maintenance and control of DNA damage. nesium, are needed by many enzymes involved with DNA replication and repair and total magnesium intake should be between 400 mg - 800 mg per day. Zinc is intimately involved with DNA as well as DNA repair. The lack of zinc causes an excessive amount of DNA strand breakage and telomere depletion. Inflammation and stress shorten telomeres and omega 3 fatty acids (eicosapentaenoic acid/docosahexaenoic acid) are important as basic nutrients to preserve telomeres. Nutrients such as quercetin, green tea catechins, grape seed extract, curcumin, and resveratrol also help maintain telomeres, with both grape seed extract and curcumin showing the ability to generate longer telomeres. In addition, resveratrol and calorie restriction activate Sirt1 with prevention of telomere attrition. Drug evaluation and differences in therapeutic effects of various drugs may indicate that the telomere length of tested rodents or diseased individuals may be related to genetic, diet and environmental conditions. Drugs such as statins have been shown to control telomere/telomerase in peripheral leukocytes from individuals with cardiovascular disease [82,83] and have provided potential anti-aging therapy for diabetes and AD. Statins, however, are not Sirt1 activators and Sirt1 activators are primarily in control of telomere length and attrition. The close association of hyperphagia with diabetes and AD indicate that fat consumption (calorie excess) may have marked effects on telomeres/telomerase activation [42,43]. Experimental drugs in mice, such as an acyl coA cholesterol acyltransferase (ACAT) inhibitor Avasimibe, that prevents fat absorption (calorie excess) have shown clear effects on body weight, liver and brain growth in mice consuming high fat diets (Abstract AD/PD Italy, 2013) possibly as a Sirt1/telomerase activator. Interests in telomerase activation have increased with the recent findings of TA-65 (purified from the root of Astragalus membranaceus/legume), a small molecule activator of telomerase involved in glucose regulation . 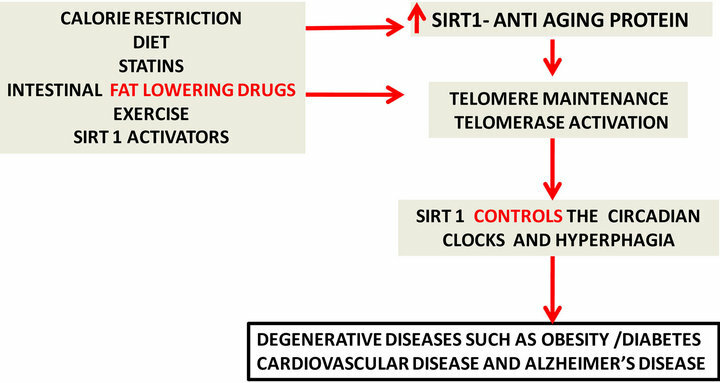 In contrast, various drugs that are Sirt1 inhibitors should be assessed with various diets since telomere shortening and attrition by Sirt1 inhibitors will lead to degenerative diseases such as obesity, diabetes, cardiovascular disease and AD. Lifestyles changes such as diet and exercise early in the life of obese or diabetic individuals may prevent circadian alterations and calorie overload. Continued Sirt1 activation and the maintenance of peripheral (liver) and CNS (brain) cell telomeres with prevention of obesity linked to diabetes may decrease accelerated aging and the risk of AD. The biological mechanism behind the global epidemic of obesity and Type 2 diabetes has become important to Alzheimer’s research since therapeutic interventions with the potential to control and stabilize their increased incidence in Western society may also have the potential to delay the acceleration in aging and AD. The increased cell senescence associated with obesity and diabetes has indicated an increase in telomere shortening and genomic instability of the cells from these individuals. Stabilization of biological aging is of particular interest in obesity and diabetes and the delay of telomere shortening in these individuals may result in a decrease in dementia and even a delay in the progression to (AD). Lifestyle, nutrition and longevity are closely connected to life span of obese and Type 2 diabetic individuals and therapeutics such as cholesterol lowering drugs, exercise and diets low in fat, target the rise in obesity and associated telomere shortening by delaying or preventing the onset of Type 2 diabetes. Implementing these anti-aging therapies early in life may prevent calorie overload and activation of calorie sensitive genes, such as (Sirt1), that may maintain telomere length and the control of obesity, which is linked to cardiovascular disease, diabetes and accelerates aging and AD. Sonneborn, J.J. (2012) Alternative strategy for Alzhei- mer’s disease: Stress response triggers. International Journal of Alzheimer’s Disease, 2012, Article ID: 684283. Bhagavati, S. (2008) Marked hyperphagia associated with total loss of satiety in Alzheimer’s disease. The Journal of Neuropsychiatry and Clinical Neurosciences, 20, 248- 249.